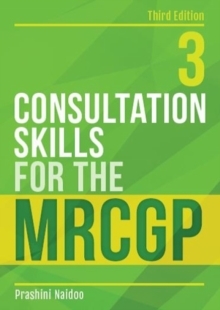 This book helps readers pull together the knowledge andcommunication skills required for success in the consultation components of theMRCGP exam, namely the Clinical Skills Assessment (CSA) and the ClinicalObservation Tool (COT). Rather than learning by rote, this book promotes amethodical, step-wise approach which will enable you to easily identify thetype of case presenting, and to work out exactly what you need to demonstratefor a successful consultation. The book features a number of cases to test and enhance yourskills, in three formats:* 13 teaching cases- these are very detailed cases which provide you with a great deal of supportand advice, including: suggested approaches to the consultation, model answers,background knowledge required, and the theoretical underpinnings of theconsultation. * 20 long cases -these build on the knowledge gained in the teaching cases and feature detailedanalysis to help you develop an ordered, step-wise approach to data gathering,clinical management and interpersonal skills. * 15 shorter practicecases - these help refine the skills you have learnt in working through theearlier cases. These cases come with marking schemes and can be used eitheralone or in small groups. Once you have worked through the book and refined thismethodical approach, you will be able to approach any consultation confident inthe knowledge that you possess the tools to succeed. Note that this edition does not contain a DVD. The 13 video cases in the previous edition have been replaced by teaching cases.